Thanks to plumbo for sharing nice script with us. This is nice hack, however I actually don’t love to invite this way. It never give anything in return. I talk someone personally and tell them about my page and let them chose if they willing to join or not. but informing first time using this tricks is ok, doing the same again and again is not ok.
defiantly it is working and we have personally tested it. check out our video guide for how to use detail. If it is not working for you test in some other browsers too (firefox). It works but FB is only allowing me to select 50 at a time. For me it selects all 163 friends at a time check that video if have doubt. You’re welcome dude… this trick definatly helps you. 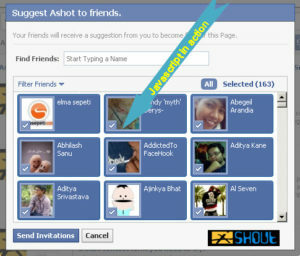 Great sharing.I like this hack.Give a try in my facebook account. Doesn’t seem to work anymore on the new facebook event invite interface. Any ideas? does this work at “Questions”? when you need to “Ask all Friends” ‘casue I have many friends in Facebook and I want to ask my question to all of them. Not tried,just give it a try…. this is not working for me…..using safari browser….